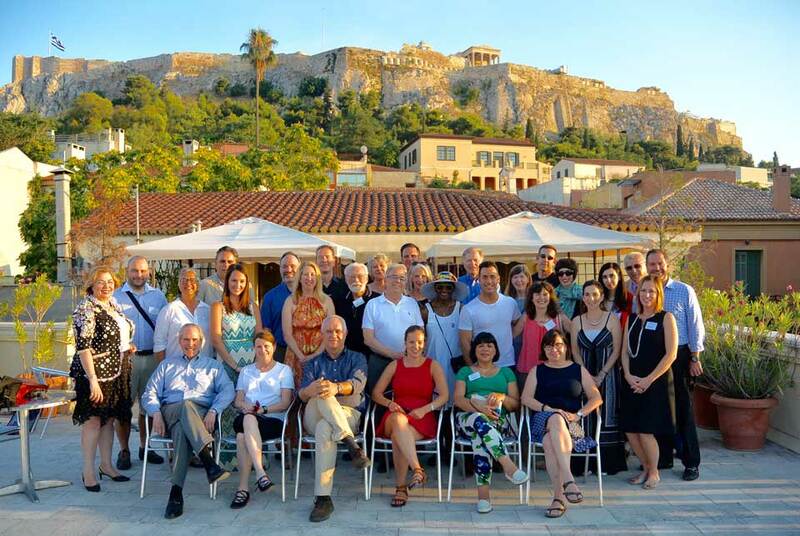 The Webster International Network of Schools (WINS) program conference, held at Webster-Athens from July 13-15, showcased Webster’s international campuses as study abroad destinations for participating institutions. This year’s conference boasted the largest number of participants in program history, with attendees coming from long-standing, new and prospective WINS institutions. This year’s conference highlighted our newest Webster campus, Webster-Athens, and our new study abroad offerings that have ranked in the top 10 on www.abroad101.com. WINS attendees included representatives from Centenary College, Columbia College, Fontbonne University, Gardner-Webb University, Kent State University, Mars Hill University, Millikin University, Saint Louis University, Sacred Heart University, Transylvania University and University of Massachusetts. The conference formally began with remarks from Provost, Senior Vice President and Chief Operating Officer Julian Z. Schuster, who underscored of the importance of the program and of the many exciting international opportunities at Webster. Schuster, along with Vice Provost Nancy Hellerud--who also led a session on academics--set the tone for collaborative and collegial discussion for the duration of the conference. Throughout the conference, participants engaged in and experienced Webster-Athens as Athens campus chancellor Vasilis Botopoulos and Study Abroad director Guillermo Rodríguez, oversaw the program from start to finish. Conference attendees gained fresh insight during sessions and events, which included detailed information on a number of topics. Rodríguez, along with Study Abroad advisor Kimberly Mantia-Ochoa and assistant director Kim McGrath, provided information on the conference objectives, the Webster campus network and WINS programs and more. Webster-Geneva academic director Ronald (Ron) Daniel, Webster-Vienna Business & Management Department head Christopher (Chris) Newman and Webster-Leiden campus director Jean Paul van Marissing provided information and a panel discussion during Hellerud’s session on academics. Webster-Athens Philosophy professor Stanley Sfekas and Communications professor Demetris Kamaras engaged participants in a lecture on ancient and modern Greek culture. McGrath and Daniel led a discussion and activity on study abroad and the Global Citizenship Program (GCP). Vice chancellor for Academic Affairs Sousana (Susie) Michailidis, Odyssey in Athens and Student Affairs director Dina Skias and faculty member Vivian Gales presented along with Botopoulos and provided detailed information on all components of the Athens campus. Michailidis and Skias also provided logistical assistance throughout the conference, and their session was ranked one of the most helpful for participating WINS members. In addition to the information and discussions, there were a variety of activities incorporated into the experience. Many Webster-Athens staff members, including academic advisor and special programs coordinator Ellie Despotaki and director of Operations Stamos-Thomas (Tom) Mazarakis participated and assisted with the events. Activities included tours of campus facilities (housing, library, classrooms and administrative offices), cultural excursions and traditional meals. Conference evaluations are being completed, and will help in planning for the next event. Additional follow-up includes the distribution of WINS materials, individual meetings and identifying the next steps to help the program better support Webster’s strategic plan. The conference is scheduled to be held again in July 2017, with the location to be announced. The WINS program, established more than 15 years ago, creates partnerships between Webster University and U.S. universities to provide access to our international campuses. Currently serving 34 institutions, the WINS program allows full time, degree-seeking students of affiliated U.S. universities to study abroad at one of Webster’s international campus locations. The program provides WINS affiliates with numerous benefits including direct tuition assistance, student travel awards covering up to $1,000, increased study abroad participation, staff development and faculty exchange. For more information on the program, or to subscribe to the “WINS Perspective” newsletter, visit webster.edu/studyabroad/affiliates or contact Kim McGrath at mcgratki@webster.edu in the Office of Study Abroad. For more information on study abroad opportunities in Athens, visit webster.edu/study-abroad/programs/greece. Visit the main Study Abroad page for all campuses, application information and more at webster.edu/study-abroad.